2013 was a stellar year for the stock market. Every major index sans the NASDAQ closed at record prices, while the NASDAQ ended a spectacular year within striking distance of the dot.com bubble highs. Meanwhile, bonds and commodities, particularly gold, struggled tremendously. Arguably we have seen the collapse of the “fear trade” in which financial doomsters were posturing their portfolios for the possibility of a second Great Depression. In our 2013 outlook, our case for a strong stock market was based in our belief that Europe was improving considerably, households were rapidly repairing their balance sheets, real estate was resurgent, energy was getting more abundant and cheaper, and the technology sector was in position for a rally. In the end, our main failing was not pounding the rhetorical table more emphatically on the setup for an epic, rather than merely strong, stock market rally. One reality we all must accept is how great years in the stock market tend to borrow from future returns, rather than enhance them. Heading into 2013, one could have reasonably expected to earn an annualized return of 6.67% – on par with the market’s average since 1925 – over the course of the next decade. The S&P 500 started 2013 at 1426. Factoring in a 6.67% annualized return the index would be at 2720 at the end of ten years. Assuming that despite last years’ near 30% return, this 2720 ten year S&P index target does not change, the expected return over the next nine years would be 4.39% annually, instead of 6.67%. In traditional financial parlance, Total Return for an investor = Alpha + Beta. Beta is the return given by the market, while Alpha is the excess return provided by active management (see our October Commentary on “Our ‘Actively Passive’ Investment Strategy). When we suggest that the market’s expected annualized return over the next ten years should drop, we are alluding to a weaker tailwind from the stock market itself—Beta— as a source of returns over the next nine years. We by no means view 2720 as a firm target for the market down the line, and we would not be surprised to see the market outperform or underperform the 6.67% long-term average. Reversion to mean (or reversion to trend) is an important force in financial markets, though it is by no means the only force; nor is it the most powerful. When we suggest that your investments might not benefit from the same tailwind that has helped this past year, there are two key takeaways: 1) great years are the exception, not the norm; and 2) markets are equally as likely to have a great year as they are a bad one. We led this commentary with a quote from George Soros that lends itself nicely to where we think the markets are at this point in time. Prior to 2013, both the economy and stock market had been inconsistent, with “sputtering” serving as the most descriptive path. While last year was a great time to be looking for an inflection point and an escape from the sputters, we think 2014 will be a year for riding the trend, though to what extent it will flow we can never be sure. The preference for contrarianism in calling tops and bottoms is part of human nature; however, the vast majority of the time, it is far more beneficial to follow, than to fight a trend. As of today, the economy is moving faster and in the continued process of acceleration. As we know from Newton’s Second Law of Motion, the greater the mass, the greater the force needed to change its direction. When an economy the size of the U.S. is accelerating to the upside, it would take an extremely massive force to first, derail its momentum and second, change its course 180 degrees. While such a force is not an impossibility, it is extremely unlikely in the coming months. 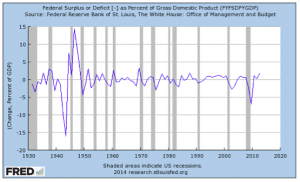 We have long emphasized that the Great Recession is an outgrowth of the de-levering (i.e. 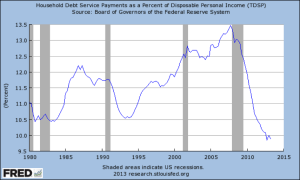 debt repayment) of the U.S. economy in aggregate. This becomes clear when we look at total credit as a percent of GDP. 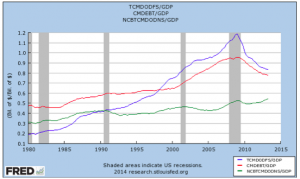 Ray Dalio of Bridgewater Associates has called this a “beautiful de-leveraging” for how smoothly the U.S. has combined austerity (a reduction in a sector’s annual deficit as a share of GDP), debt restructuring (the refinancing of existing debts to longer maturities and lower interest rates) and the printing of money (aggressive monetary policy). Within this broader context, it’s important to look at each of the individual private sector components. Household balance sheets stopped declining and in aggregate, essentially flat-lined. When household credit neither grows nor contracts, but GDP does in fact grow, then household credit as a share of GDP declines. 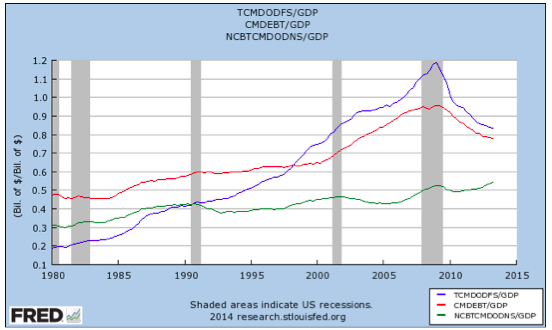 This is subtle and important when looked at in terms of the gross levels, but clear as seen relative to GDP. More violent contractions in household credit would come alongside equally more violent fissures in our financial market. As such, the subtlety itself is a core component of the “beautiful” nature of our deleveraging. Importantly, the non-financial corporate sector (the green line) is moving upward/levering up for the first time in years, and it is the only sector to do so. We have argued for some time this is the private sector arena with the greatest capacity for expansion in borrowing. Companies have been well capitalized for a while now; building up massive stockpiles of cash due to a lack of good investment opportunities. For now, much of this new debt has been used for repurchases of the existing equity stock. 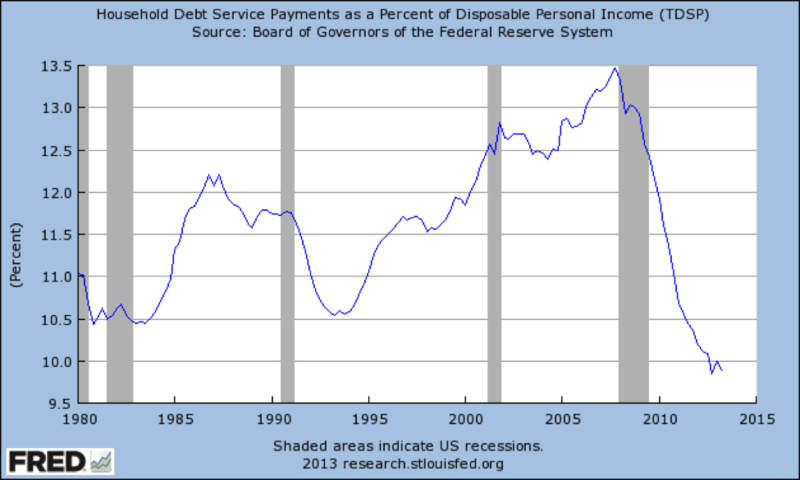 While this is less beneficial than outright new investment, we think the re-levering of the corporate sector has afforded capacity for both households and our government (which is not included in this private sector snapshot) to accomplish their own deleveraging without leading to more pressure on the broader economy. In our September 2012 Commentary, we highlighted two companies we invested in who took on greater leverage in order to smartly allocate the proceeds. One company opted for share repurchases, while the other made an aggressive acquisition. Both increased their leverage and both saw their stocks appreciate at a faster clip than the market in 2013. 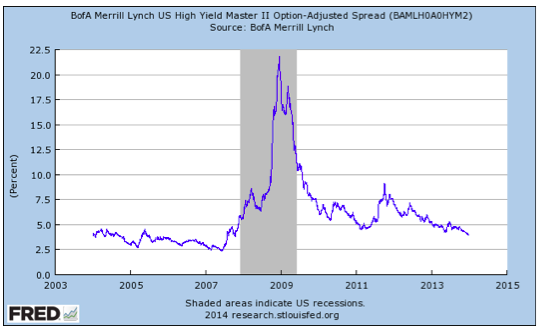 The normalization of credit spreads over the past year has been one factor to help the corporate sector take on new borrowings. It also provides a nice snapshot for just how far the economy has moved towards normalization since the dawn of the Great Recession. 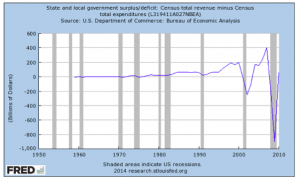 During the depths of the Great Recession, while the headline presses focused on the U.S. Federal Government’s increasing deficit, there was a rapid contraction in expenditures on the state and local level. 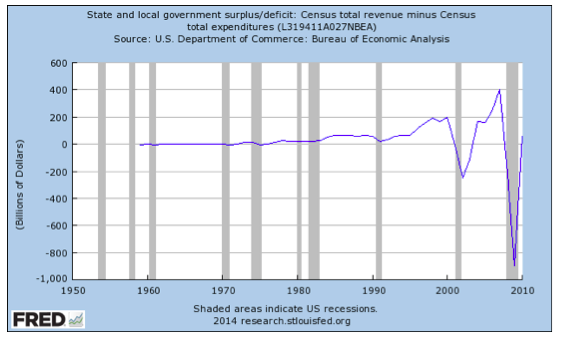 While state and local governments also ran deficits during this period, they were due exclusively to shortfalls in revenue instead of growth in expenditures. State and local governments were particularly at risk with the rapidly declining real estate market and employment situation. 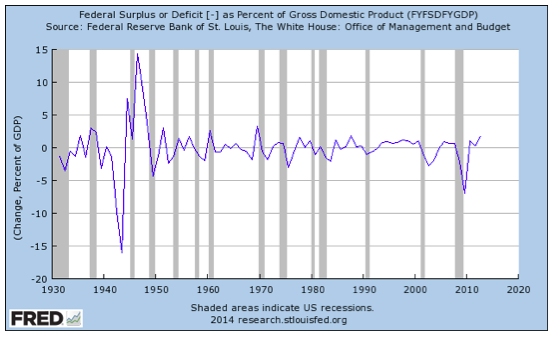 Last year was also one of the biggest contractions in the Federal deficit as a share of GDP in recent history. Some estimate the “fiscal drag”—the headwind provided by a contraction in the government’s deficit as a share of GDP—was as high as 2.4% of GDP. 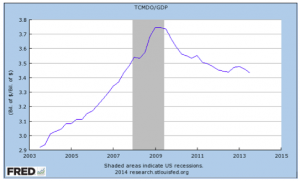 This alone is more than our averaged annualized growth since escaping the Great Recession. Considering 2013 was a positive year for GDP growth overall, it goes to show just how strongly the private economy is performing right now. 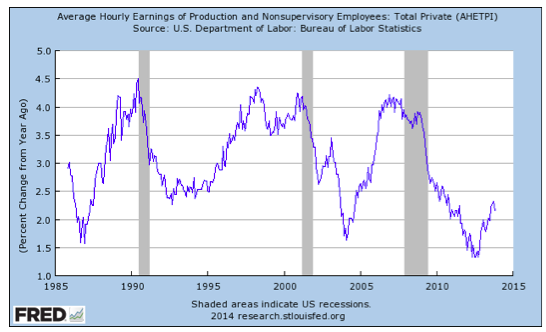 Importantly, people who have their jobs have been in a much more stable position than any time in the recent past. This serves several critical roles including offering a much-needed boost to consumer confidence in order to enable spending, and affording workers the opportunity to seek out more attractive options without as much worry. Workplace mobility is an important factor in helping workers seek out higher pay, career advancement and entrepreneurialism. This year we introduced a quarterly review that takes a look at our three best and worst performers during the covered time period. Since this is our year-end report, this edition of “What do we own?” will focus on our three best and worst performers for the year, with a twist: we will focus only on those firms that we still own today and not positions that have been exited during the year. With companies purchased in the calendar year, we will focus only on performance from the date at which we commenced our position. Our primary goal in introducing this section has been to help share with you the source of our interest in our portfolio companies—both the good ones and the bad—and not as an explicit means to highlight performance. Considering our low turnover, writing about new positions would often leave us without any companies to comment on. As a result, leaders and laggards provide a natural starting point for this conversation about what we own. This was a very special year, for none of our three core equity positions in “The Laggards” actually went down for the year and/or from the point of our purchase (we do own bonds in some accounts and these did experience losses during the year, though they were modest in each position and immaterial on the portfolio level). Rather than an accomplishment, this is purely a stroke of luck—a stroke of luck which we would welcome time and again. Exor is an Italian-based holding company, serving as the investment vehicle for the Agnelli Family—the founding family of Fiat. Fiat itself was an exceptional driver of returns at the parent company, with its own impressive 66.33% return on the year, though it was hardly the only catalyst for our shares of Exor. Our position commenced as a stake in the Preferred shares; however, in the first quarter, Exor undertook an initiative to streamline the capital structure and merge the preferred stock into the common. Since the preferred were trading at a discount to the common, this sparked considerable upside for our stake. Further aiding shares were the merger of Fiat Industrial (formerly part of Fiat itself) into CNH and the successful sale of Exor’s stake in the Swiss-based SGS. We were first attracted to Exor because of our interest in Fiat, Exor’s considerable discount to Net Asset Value, and its sharp management team behind a well-rounded portfolio. All factors continue to remain attractive into the New Year, despite the strong run-up in shares. Shares of Cree were a first quarter “Leader” and third quarter “Laggard” in our portfolios, though the year itself was truly a breakout. As of 2014, consumers can no longer purchase 40- and 60-watt incandescent light bulbs. Notice that this ban did not enter effect until 2014, yet Cree had a banner year in 2013. Obviously the look-ahead to 2014 helped shape investor expectations about the stock, but most importantly, the fundamentals at Cree took a huge step forward ahead of schedule. Cree’s accomplishments are greatest on two fronts: they have by far the highest quality of light-bulb and they are able to offer this quality at an extremely competitive price, sans subsidy. With the introduction of an Edison-styled light bulb at Home Depot, Cree was able to quell concerns that the incandescent light bulb ban would result in a marked decline in the quality of indoor lighting around U.S. households and business. Innovation delivered quicker than any expected in this case, and to that end, Cree’s stock considerably outperformed our expectations. Cree enters 2014 in great financial shape, though at a modestly expensive valuation. Despite that, we think the growth trajectory for the company remains extremely favorable. We commenced our position in the NY Times on January 31, 2013. We viewed the Times as a sum of the parts situation involving three parts: 1) a valuable Manhattan skyscraper; 2) a run-off print newspaper business; and, 3) a venture capital-type Internet startup. When the Times was in distress during the Great Recession, they sold an interest in the NY Times building through a finance lease. This afforded the opportunity for the company to repurchase this valuable property fifteen years from the date of the sale. As New York real estate breaks out significantly from the trough days of the Great Recession, the value of this repurchase option is levered to NY real estate prices and increasing accordingly. The market continues to under-appreciate this source of hidden value. Moreover, with a spate of aggressively valued media-based IPOs, premised on the potential for growth, we felt the NY Times online platform—itself on the receiving end of millions of global eyeballs—had the understated capacity to enhance monetization. The Times continues to innovate in digital display, with features like Snowfall, and the paywall continues to exceed all expectations, while setting the bar for its peers. We purchased America Movil on July 1, 2013 and since then the stock has exhibited little movement. We spent much of the early summer looking for bargains in Emerging Markets as fears escalated over what the Federal Reserve Bank’s “tapering” would mean for EMs and whether China would be able to execute a “soft landing.” America Movil fit several qualities that we find extremely attractive: it has one of the best capital allocators (Carlos Slim) as an owner-operator buying more shares with his own cash; the company is repurchasing shares at a furious pace (over 7% of shares outstanding in 2013); and it operates in a recurring revenue business that is one of the last expenses any individual would cut even in the worst economic times. Sentiment is extremely low on this stock right now due to the uncertainty of the Mexican telecom regulatory regime and the aforementioned concerns related to EMs. We view this confluence of risk factors to be far more superficial than fundamental to the business, and think America Movil is in a great position to be a steady compounder over time. 2014 should be better than 2013 here. Teva was a member of the “Laggards” section in the third quarter, and obviously disappointed us considerably on the year. The pharmaceutical and biotechnology sectors enjoyed a blockbuster 2013, while Teva languished in dark. Mr. Market continues to look with scorn upon the impending patent expiration of Copaxone and in so doing, continues to ignore the valuable generics business. In our third Quarter note, we heaped praise upon Dr. Jeremy Levin as CEO, though in a surprising move, Teva and Dr. Levin decided to part ways. In light of Dr. Levin’s departure, we spent considerable time revisiting our analysis on the company and remain convinced the value is extremely attractive. An Israeli activist investor, Benny Landa, has stepped up to provide an important advocate for shareholders and looks to close to securing a well-regarded “turnaround specialist” in Erez Vigodman as the new CEO. This would be exactly the type of catalyst this stock needs in order to get Wall Street’s short-term attention span focused on the future rather than the recent past and the next fifteen minutes. Cisco had a disappointing 2013 on all levels. The stock had been performing fairly well until a huge warning on revenues in the November earnings release—between 8 and 10% sequentially. Despite this ominous warning, Cisco stock remains very cheap. However, as time marches on, our confidence has started to waver in John Chambers’ leadership as the company remains overcapitalized, continues to repurchase shares, and yet its share count fails to materially shrink. There is simply no excuse for the company’s lackluster effort to follow IBM’s template of smart capital allocation in technology. From our seat, it seems as though Chambers is more willing to use his excess cash position to trumpet political talking points (about his desire for a tax holiday on repatriation of foreign earnings) than he does for shareholder value. The reality is that the company would be a considerably more valuable and respected by the stock market had Chambers simply paid taxes to repatriate all of its cash and repurchased shares in a tender than engaging in public advocacy. That being said, we continue to view Cisco as a great value with a substantial margin of safety, though should we not see further progress on capital allocation we might simply leave this investment for greener pastures in the coming months. Only time will tell what this list will look like next year at this time. Thank you for your trust and confidence, and for selecting us to be your advisor of choice. We wish you and your families a healthy, happy, and prosperous 2014. Please call us directly to discuss this commentary in more detail – we are always happy to address any specific questions you may have. You can reach Jason or Elliot directly at 516-665-7800. Alternatively, we’ve included our direct dial numbers with our names, below. This entry was posted in 2013, Commentary on December 10, 2013 by RGAIA. Market participants have consistently been ahead of the Fed in expecting a step back from the aggressive policies implemented to lift our economy out of the Great Recession. This makes sense in light of how the economy as represented by the stock market has improved at a much quicker pace than the “real” economy—the so-called “Wall Street” vs. “Main Street” dichotomy. While this is a relevant distinction, it is not the only point missed by the discourse surrounding whether the Fed will or will not taper. When Wall Street analysts speak of tapering, they are implying something deeper, which many market skeptics openly and regularly lament: there is this notion that tapering is a major risk to the stock market. The skeptical argument goes as follows. “The stock market is not rallying for fundamental reasons. The economy is not really improving. This rally is happening purely because of QE.” The follow-on logic is that as soon as QE ends (aka tapering begins), then the rally will all fall apart. Again, the embedded assumption here is that the real economy has not improved, but the stock market itself has rallied. It is clear that something does not add up. The Fed has maintained it will not end QE unless and until we have a sustainable recovery, while the skeptics are arguing the end of QE will lead to a stock market correction because we have not had a sustainable recovery. These two positions are mutually exclusive, unless the skeptical argument is actually that the Fed will be fooled into thinking there has been a sustainable recovery, when in fact there has not. It is important to point out the inconsistency in the fact that those most skeptical of QE are calling for its immediate end now despite this contradictory reality. We think this sheds more light on the biases possessed by these skeptics than it does the state of the economy. Alongside this skeptical refrain has been the meme-ification that “good news is bad news.” This amplifies the inconsistency in the skeptical argument against QE, for if this is all an illusory stock market rally due to QE, then good news would in fact be good news independent of any Fed policy path. This notion is a textbook example of absurdity. Yes indeed, good news is in fact good. It amazes us that such a simple point of fact needs to be said in this environment. It is impossible to know whether this “unwinding” was willful on the part of the Fed, but it did in fact help set the stage for a reduction in the impact of a policy shift once tapering does in fact occur. 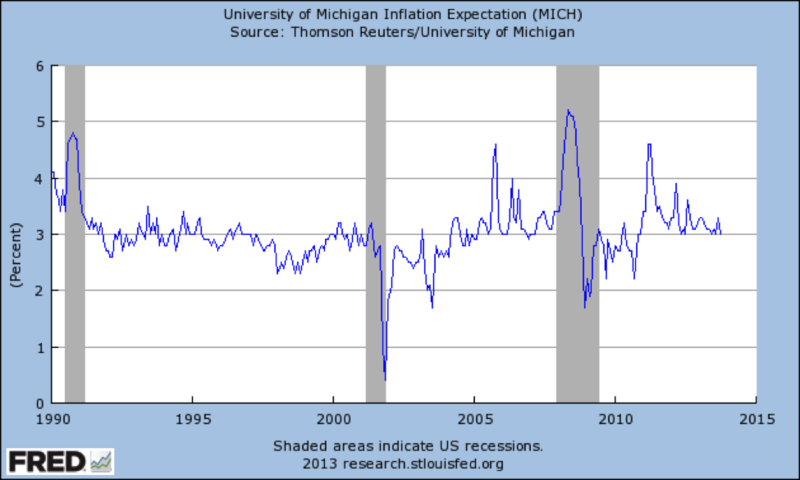 This chart shows inflation expectations since 1990 based on a survey conducted by the University of Michigan. Expectations serve an important role, because they reflect what the average person thinks, rather than what actually and necessarily will transpire. 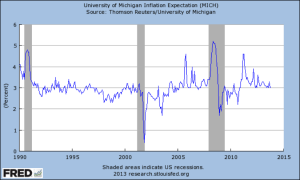 In the Great Recession (2007-2009), the U.S. faced by far its greatest risk of a deflationary spiral, yet notice how inflation expectations never went negative, and never got close to the depths they did in the recession following the bursting of the DotCom bubble. Credit for this goes to Chairman Bernanke for how effectively he conveyed the role Fed’s policy would play in aiding an economic recovery. This highlights just how far household balance sheets have come. Balance sheets have quickly evolved from being overburdened by debt, to having even greater flexibility with financing than any point before the prior two boom periods. Again we want to emphasize that this entire conversation about an imminent end to QE comes on the heels of improving economic data, and while some view these higher Treasury rates as cause for concern, we view them as a reflection of the underlying improvements. This is something that should make us all feel more comfortable about where the economy is, and is heading, and not something anyone should lose sleep over. There is another point to make about communication. This year will mark the end of Bernanke’s term as Fed chairman, after which he will be replaced by Janet Yellen. Many credible Fed insiders have stressed Janet Yellen’s high regard for communication as a Fed policy tool and believe she will use it to an even greater degree than Bernanke has. This will be worth watching (and listening to) moving forward. While we never make decisions based on Fed policy, we think it is very important to address and add context to the many concerns hitting mainstream media about a potential shift in Fed policy. This is reflection of strength, not a projection of fear for financial markets. It is also important to remember that the stock market and the economy do not necessarily move in lock-step. Sometimes the stock market is ahead of the economy, and sometimes it behind. This is merely part of why picking tops and bottoms is a challenging task. Equally important is acknowledging the reality that when the stock market outperforms its long-term annual average return by a wide margin in a calendar year, it is pulling forward future returns. To that end, we do not expect future returns to be nearly as strong as they have been these past two years. This is a simple reality lost on many. Lastly with regard to the stock market, when a large coefficient of the return stems from an increase in the market’s multiple (P/E ratio expansion of the broader indices), then the protection afforded by valuation is inherently lessened. Higher valuation alone is not a risk in and of itself. Too many are making this misguided case. This reality simply means that in the event of a shock, the market has more downside risk than it has in the recent past. These points matter more in the context of how they should shape our expectations moving forward than they do in terms of the actual risks facing our companies’ earning power. Despite the market’s continued rally, we see little reason to change our overall positioning. As we explained in recent months, we have a healthy allocation to equities in Europe, which are only impacted indirectly by Fed policy, and we already trimmed our lower conviction US positions. Our cash balance remains rather plush. If the market keeps grinding higher, it is all but certain some of our remaining positions will pass the upper reaches of our fair value range at which point further selling would be warranted, though there are no guarantees. 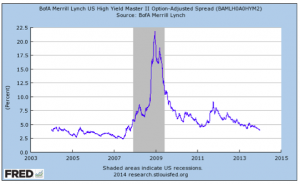 One market disconnect that we have bought into is the muni bond market. We will look to increase our stake in this area over the coming months. This asset class is sensitive to interest rates considering its long duration, though through the use of vehicles like Closed End Funds, many of which are trading at steep discounts to their net asset values, we think we can both mitigate risk and put ourselves in position to generate a nice return. 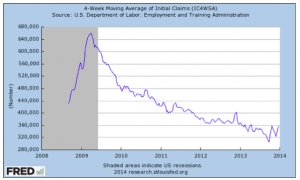 This entry was posted in 2013, Commentary on December 6, 2013 by RGAIA.